Stems: Erect or ascending, 1 to several, usually branched above, appressed-hairy. Leaves: Alternate, simple, sessile, linear, 1/2 to 2 inches long, less than 1/4 inch wide, appressed-hairy; margins entire; tips pointed. Flowers: Flowers of 2 kinds; early spring flowers showy; calyces 5-lobed, much shorter than corollas; corollas trumpet-shaped, tube 3/4 to 2 inches long, top limb about 1/2 inch wide, 5-lobed, bright or pale yellow; margins of lobes prominently fringed; late spring and summer flowers inconspicuous; corollas less than 1/4 inch long or absent, self-pollinating. Fruits: Nutlets, 4, small, smooth or pitted, shiny, white, each containing 1 seed. Habitat: Dry, upland prairies, disturbed sites, and open woods, in sandy, clay, or loamy soils. Uses: Native Americans used the roots, stems, and leaves to treat coughs, colds, delirium, and paralysis, and obtained a bluish-violet dye from the roots. Comments: "Puccoon" is a Native American word. 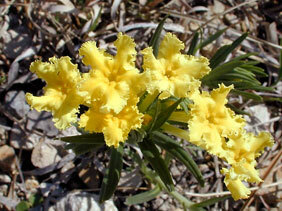 See also hoary puccoon and Carolina puccoon .